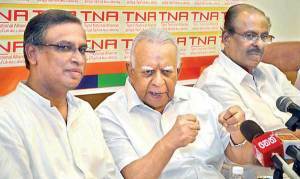 The Tamil National Alliance (TNA) has decided to exert pressure on the government, urging it to get it’s act together and stop dilly dallying on whether or not to permit foreign judges in a war crimes probe. “President Maithripala Sirisena is of the view that foreign judges must not be permitted in such a robe, while the government led by Prime Minister Ranil Wickremesinghe says that foreign judges must be permitted. It is obvious the current administration cannot take a stand on this crucial issue, and hence the TNA has decided to take this matter up at the highest level,” TNA sources told Colombo Telegraph. The TNA is of the view that this is the best time to raise this matter, specially as United Nations High Commissioner for Human Rights Zeid Al-Hussein is scheduled to present his oral submissions on Sri Lanka on June 29, 2016 at the 32nd session of the UN Human Rights Council, in Geneva. TNA sources also noted that the government in it’s effort to try and appease the UN is implementing certain initiatives without following proper procedure and in a hurried manner, which was affecting the genuine reconciliation process. In May, the government went ahead and set up the ‘Office for Missing Persons’ in a vague manner, without carrying out proper consultation with the victims and the affected communities. “If this trend continues, there can be a breakdown in the reconciliation process,” they warned. Appointing A New Governor For The Central Bank! “First TNA need to explain why they asked the Tamil masses to vote for Sirsena and Ranil without any pre conditions………….. I pity Manicka Vasagar who is the Minister of Foreign Affairs of TGTE. Apparently he is a poor choice for that portfolio. He is in the habit of exhibiting private ignorance in public for everybody to see. The TNA was elected by the Thamil people of North and East with an overwhelming majority. In the North the TNA polled 297,463 (61.83%) and in the East 218,500 (30.87%) during the 2015 August elections. TNA is not negotiating for a unitary state. it is already there. What the TNA is negotiating is power sharing through a federal system of government within an undivided country. It is time he stops playing the role of a court jester for the TGTE. The TNA has not achieved everything it wanted, but has made some progress in regard to reclaiming land grabbed by the army, release of prisoners and providing livelihood to war victims. In Valikamam North 1,959.5 acres of land out of a total of 6381.5 acres have been returned to the owners leaving a balance of 4,423 acres. A total of 2,125 families have been resettled. In Kepaappulavu 1,000 acres of paddy land has been released to the owners. In Sampur over 1600 families have been re-settled in 1,055 acres of land confiscated by Mahinda Rajapaksa after 2009. He gave this land to Gateway Industries Ltd controlled by one of his close relative on a 99 years lease to build heavy industries investing US$ 4 billion. According to Minister for Rehabilitation and Resettlement a total of 4,140 acres of land have been released to Thamil families living in the North and East since January 2015. In Jaffna there are 12,000 families still living either in welfare centres or with friends and relatives as their lands have not been not released for resettlement. The largest area of lands occupied by the armed forces is in Thellippalai and Kopay D.S. Divisions. A total of 500 acres in Kilinochchi had been released to the owners. The Nadeswara College which came under Valikamam North is now functioning. Rs.3 million has been allocated for reconstruction purposes. The Japanese Government has provided Rs.2, 100 million to complete the construction of the research and training centre of the Jaffna University. In the Northern and the Eastern Provinces, 2400 war-damaged houses were renovated at a cost of Rs. 480 million. Under this programme, Rs. 200,000 was provided to each family for the renovation of houses. Rs. 418 million has been allocated to improve the sanitation facilities of 7,600 families. These families will be provided toilets each costing Rs 55,000. Rs. 632.70 million have been allocated to develop the infrastructure facilities in the resettled areas. Utilizing these funds, roads and school buildings will be renovated while improving sanitation and drinking water facilities in the schools. War has affected many families severely, and left many families without livelihoods. In order to improve the livelihoods of these families, measures have been taken to Rs. 1,205 million has been allocated provide Rs. 100,000 as livelihood assistance to each family. Rs. 154 million have been allocated to provide optional lands and to construct permanent houses to develop infrastructure facilities to people in the Mannar District whose lands are in the possession of armed forces. Rs. 110 million has been allocated to the Palmyra based livelihood development programmes and Rs 50 million to expand the services of Palmyra Research Institute and the development works are underway now. Rs. 1987.35 million has been allocated for certain special projects for various purposes in the Jaffna District. A cultural centre close to Jaffna library at a cost of Rs.1, 400 million with financial assistance from India is nearing completion. The scheme to construct 65,000 prefabricated houses by Arcelor Mittal Construction has been abandoned since they are not suitable to our environment and tradition. Instead, 65,000 cement brick houses will be built over 3 years. The NPC recently handed out livelihood payments to 830 families consisting of war widows, ex LTTE cadres and handicapped worth Rs.43 million. Out of 159 army camps in the North, 59 had been closed. Out of 217 political prisoners 67 has been released/acquitted by courts/given bail by courts. Although meagre, these achievements were possible because of the change of government in which Thamil and Muslim voters played a crucial role. In 16 Sinhalese dominated districts Mahinda Rajapaksa had a lead of 332, 705 votes, but that was wiped out and President Sirisena won the election by a majority of 449,072 votes. That is 781,707 votes came from the remaining 6 Thamil and Muslim majority electoral districts. The TNA has vented its frustration over the inordinate delay in resettling all the IDPs in their original homes, the release of political prisoners and action regarding involuntary disappearances/missing persons. The wheels of the government are painfully moving slowly not only in regard to problems faced by the Thamils, but in other sectors of the government as well. Yet compared to the previous authoritarian regime there is progress. During Rajapaksa’s dispensation NOT a single house was built or renovated by the government. Basil Rajapaksa said the government has no money even to renovate damaged houses, not to speak of new houses for the IDPs. Politics is the art of the possible, attainable and choosing the second best. 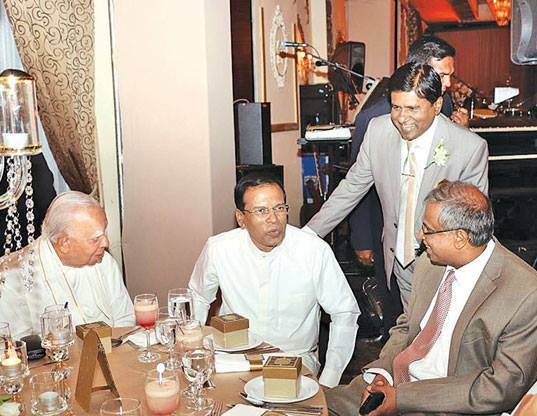 With Rajapaksa and his Ministers, the TNA held 18 rounds of talks, but they walked away from the table unilaterally. In contrast the TNA can talk to President Sirisena, Prime Minister Ranil and other Ministers freely. Even in cases where we cannot agree, we agree to disagree which was not the case under Rajapaksa’s tenure of office. Manicka Vasagar’s TGTE is like a three headed donkey. It was sitting on the fence during the Presidential elections held in January 8, 2015. The Prime Minister of TGTE said in a release “If Mahinda Rajapaksa succeeds; the Thamils could expect a worsening of their situation in the short term and perhaps a better one in the long term. If Maithripala Sirisena prevails, there is a possibility of an immediate respite but in the long term a worsening of the situation. On the whole, Tamils could only expect negative outcomes from these elections. We trust that our people in the homeland will take these assessments into account when choosing their course of action in these elections.” This statement is neither fish nor fowl. It showed the political bankruptcy of the TGTE. The statement indirectly called for the boycott of the presidential elections. In fact, a TGTE Senator said the best would be to have a common Thamil candidate to contest the election despite the fact he will lose the election! So much for the extra-ordinary ‘political foresight’ of the TGTE. My advice to Manicka Vasagar, if you want to indulge in a campaign of vilifying the TNA we too can return the compliments. He will be better off if he pays attention to his own TGTE’s agenda viz (1) Holding a UNO supervised referendum in the North and East, (2) International investigation to probe human rights violations, war crimes and crimes against humanity and genocide, (3) Repeal of the 6th Amendment and (4) Release of political prisoners. Of course the TGTE had not offered any financial or material help to the thousands of IDPs, 89,000 war widows, ex 12,000 LTTE cadres which is a shame. But it is acknowledged that some individual members did provide financial assistance.